It has been almost a full year since we got married and went on a fairytale honeymoon... where has time gone?!? I realized that after all this time I have shared almost nothing about our wedding and honeymoon... So time to remedy that! 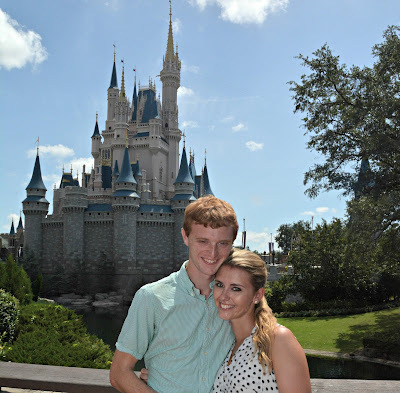 With no further ado, I am sharing everything about our honeymoon at Walt Disney World! We chose Disney World for our honeymoon for a variety of reasons. First, I am the worlds biggest Disney lover. My wonderful husband will also never pass up an opportunity to watch The Lion King with me. 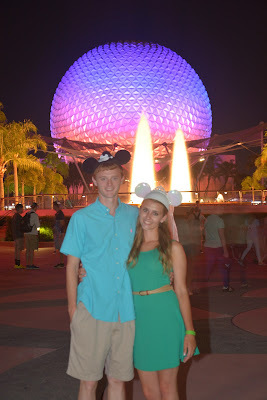 Disney is something we both love and we knew we would have a blast. Second, we haven't been since we were kids. We wanted to go as adults and do whatever we wanted (aka never step foot in Its a Small World because my mother forced me to ride it too many times as a child). Third, we figured it was our one chance to go there kid free. Fourth, Disney is renown for their impeccable hospitality and for our honeymoon, we wanted all the fanfare and the cute little "Happily Ever After" buttons that cause almost all cast members to congratulate you. 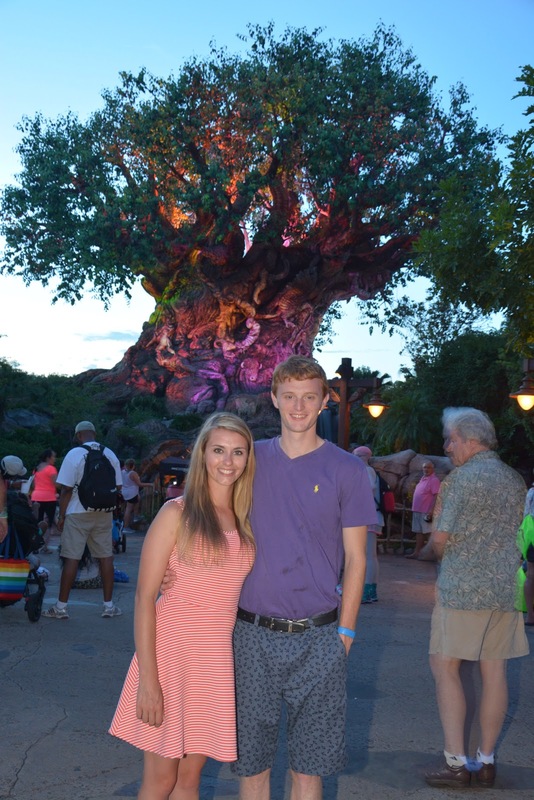 Also, Disney is just such a fun and happy place full of magic. There was nowhere else where I think we could have let go of all worries and just have fun and be as carefree as children. It is truly the happiest place on earth full of so many amazing memories and we have not regretted our decision to take a "Disneymoon" one bit!! We stayed at Disney's Coronado Springs Resort. We chose to pay extra to stay on Disney property because they provide so many little extras for you. Transportation is so simple, you can use your magic band as a room key and the Disney magic is all around you at all times. Coronado Springs was a lovely resort with a Spanish colonial Mexico theme. 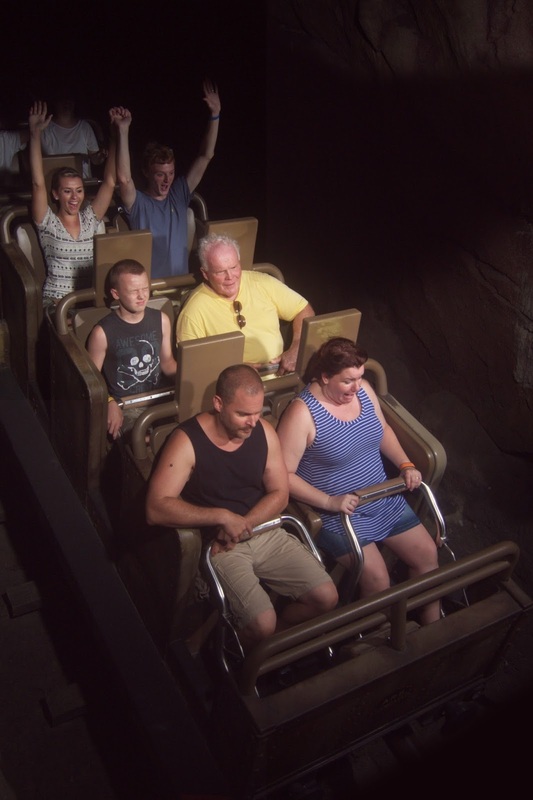 We chose it because it was rated as the most "adult" of Disney's resorts and had extremely highly rated bus service which is a MUST in mid-summer busy Disney. Our bus service was excellent throughout our stay- I think the longest we waited was 15 minutes the whole trip. Our room was spacious, clean and decently updated. We were very comfortable and enjoyed our stay immensely. It has the most awesome pool area with a waterslide and a giant replica of Mayan ruins. There is also the biggest hot tub on Disney property so that's awesome. We loved taking evening strolls around the lake (don't touch the water though! ); it was so peaceful. We left for our honeymoon the Monday following our Saturday wedding. That gave us Sunday to recoup and spend time with family and finish up last minute packing. My husband's parents were nice enough to drive us to the airport Monday morning and we boarded our flight and were off for a magical week! Once we arrived in Orlando, we went straight for the Disney Magical Express. This is a free service Disney offers for those staying on site. It delivers you and your luggage to your resort in Disney style. This was one of the many perks that convinced us to stay on Disney property. We settled into our resort and checked out the grounds (mostly the awesome pool). We decided to catch a bus to Disney Springs for the evening (formally Downtown Disney). We had a lovely dinner at The Boathouse out on the deck and did a bit of shopping in the giant, amazing Disney store (I wanted everything). It was a perfect, peaceful first evening in Disney. 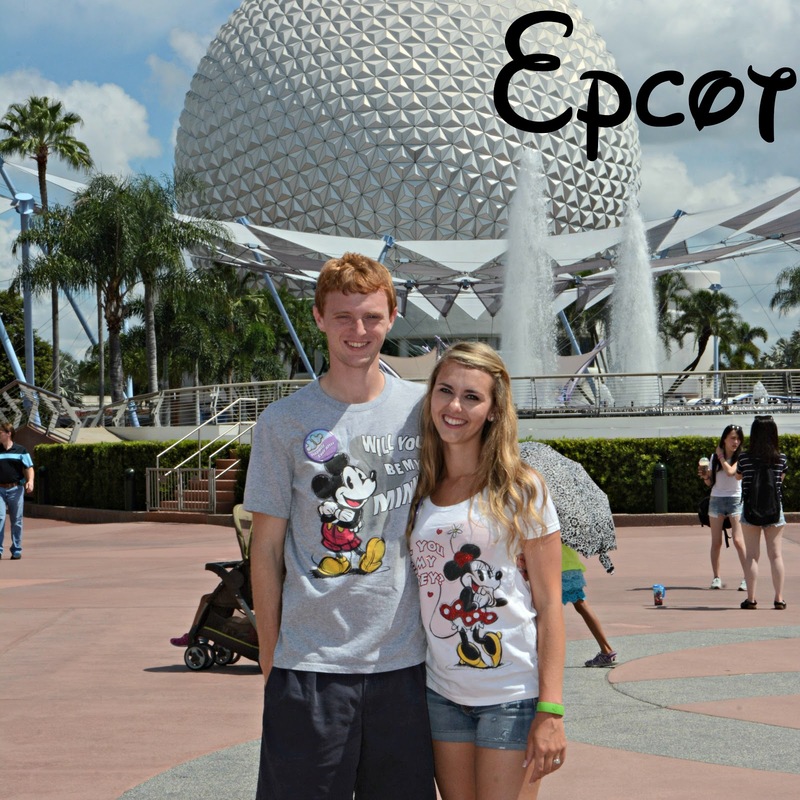 We started out our Disneymoon in Epcot! Being super excited, we were up bright and early and at the park when it opened. Epcot is such a great park for adults- the countries exhibits are so much fun and I find them so educational (yes I know I am a giant nerd). It truly feels like you are exploring another country for a few minutes and the food is amazingggggg. My favorite ride at Epcot was definitely Soarin'. It is just breathtaking in every way. They had just released the new around the world version when we were there and wow was it amazing... made me want to travel the world (which I did on the other side of Epcot lol!). 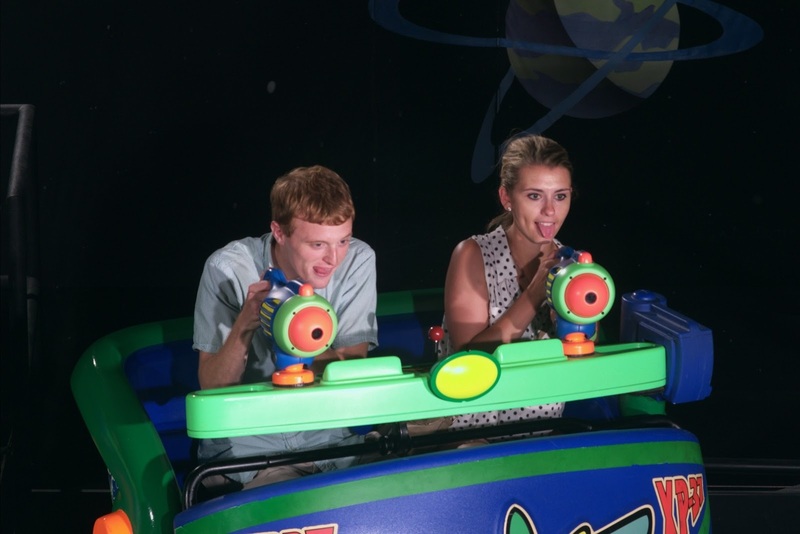 Test Track was my husbands favorite (surprise surprise) and we also both love Spaceship Earth. I have a family friend who works in Epcot and she hooked us up with custom embroidered Bride and Groom Mickey ears! They are so stinking cute and we loved wearing them for the day. She also hooked us up with front row seats for the Epcot firework show: Illuminations: Reflections of Earth. We ended up sitting down on the dock with the guys who press the buttons that make everything go boom. It was SO freaking cool. They told us all about how everything worked and we could feel the heat of the fireworks on our faces. It was incredible and we were so thankful for the opportunity. 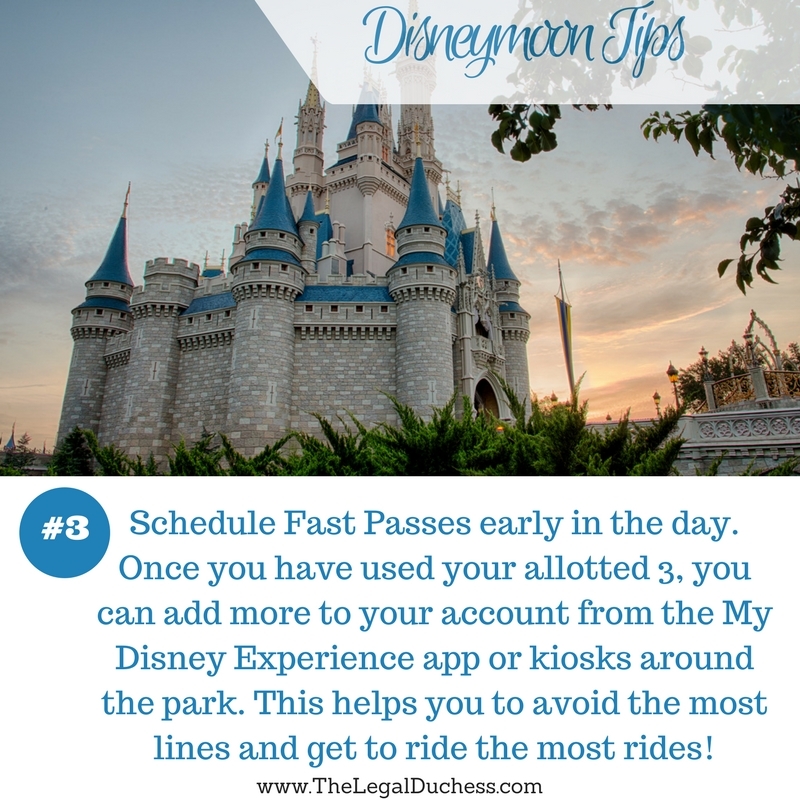 We had breakfast on the go inside the Land Court before our FastPass for Soarin'. It was quick service and easy and had Mickey shaped waffles so no complaints here! We snacked at various places around the world for lunch: beer in Germany, eclairs in France and so many other goodies! I love all the cultural food and it was a perfect way to fill the early afternoon. Dinner was at the Rose & Crown English Pub and it was to die for. I had corned beef and cabbage and it was probably the best meal I ate all week. I loved it. Rose nd Crown is also one of the best locations for viewing the night show Illuminations- we did not end up needing that but it is a great thing to keep in mind. Want to know how we got these awesome photos? We purchased the Memory Maker Photo Pass! 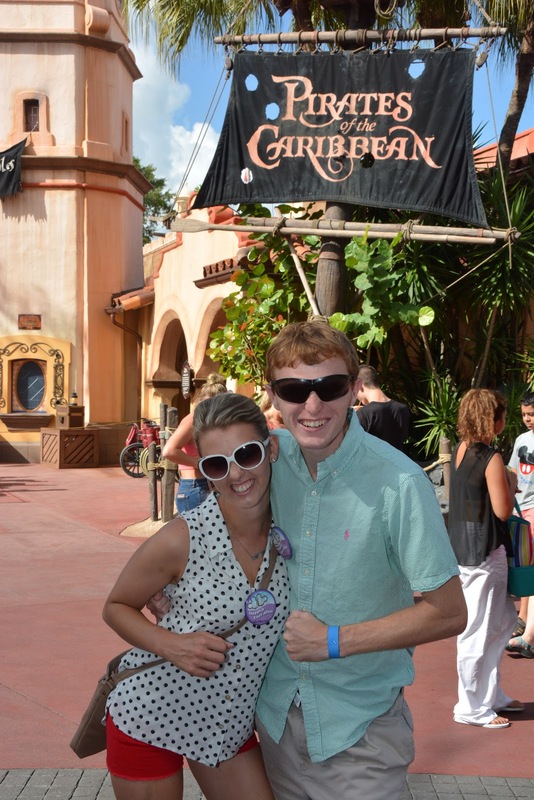 With a simple tap of our magic bands, we got professional photos taken all around the park plus all ride photos linked right to our My Disney Experience app for download. It saved us for taking awkward selfies or begging strangers to take our photos. Also, they are professional photographers with professional cameras so they get the best angles, the best backgrounds and are super high quality. It was 110% worth the investment! 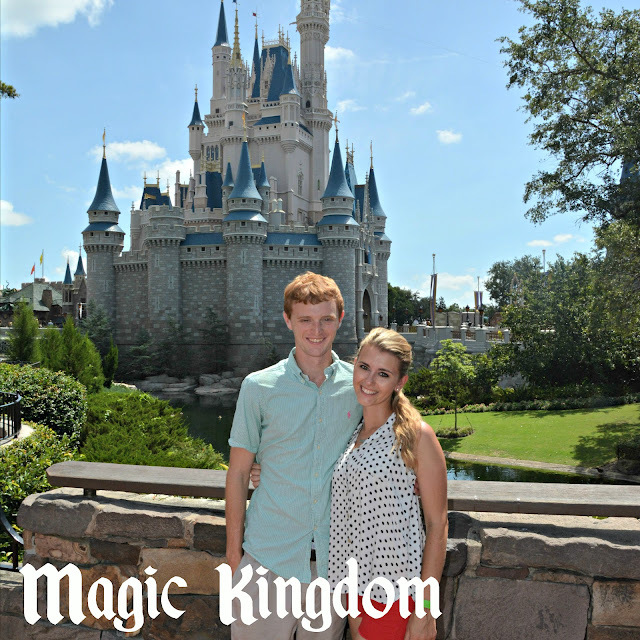 Oh Magic Kingdom... my absolute favorite. The minute I caught a glimpse of Cinderella's Castle, I truly felt that Disney magic. We got into the park extra early with a breakfast reservation at the Crystal Palace. We had a lovely breakfast with Pooh Bear and all his friends because we may be married adults but we still love to take a picture with Tigger. After breakfast, we had a few minutes to take pictures in front of the castle and get all hyped up for our first ride of the day- Pirates of the Carribean. Some of our Fast Passes for Magic Kingdom were Seven Dwarfs Mine Ride, Space Mountain, Big Thunder Railroad and Buzz Lightyears Space Ranger Spin. By timing things right we were also able to get on the Jungle Cruise, The Journey of the Little Mermaid, Adventures of Winnie the Pooh and The Flight of Peter Pan with decent wait times. Other fun things include the Hall of Presidents, Swiss Family Treehouse and Monsters Inc. Laugh Floor. We skipped Splash Mountain because we did not feel like getting wet! 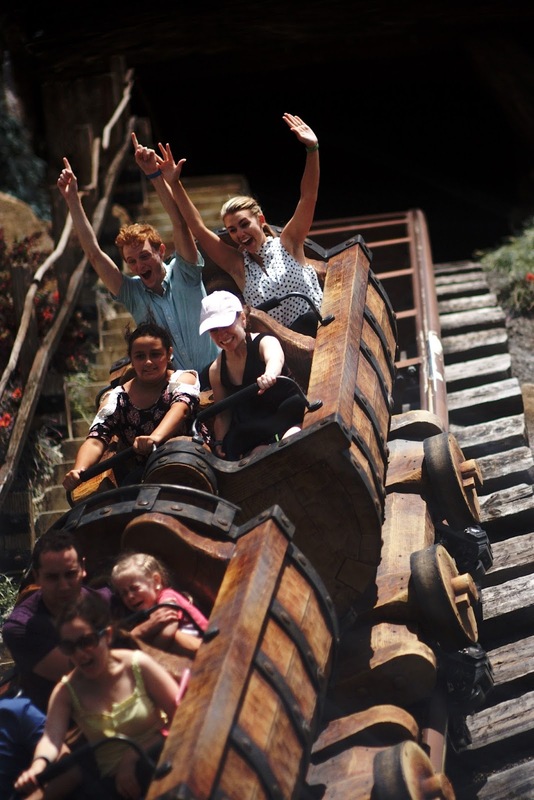 We love us a good roller coaster- arms up on the Mine Ride! 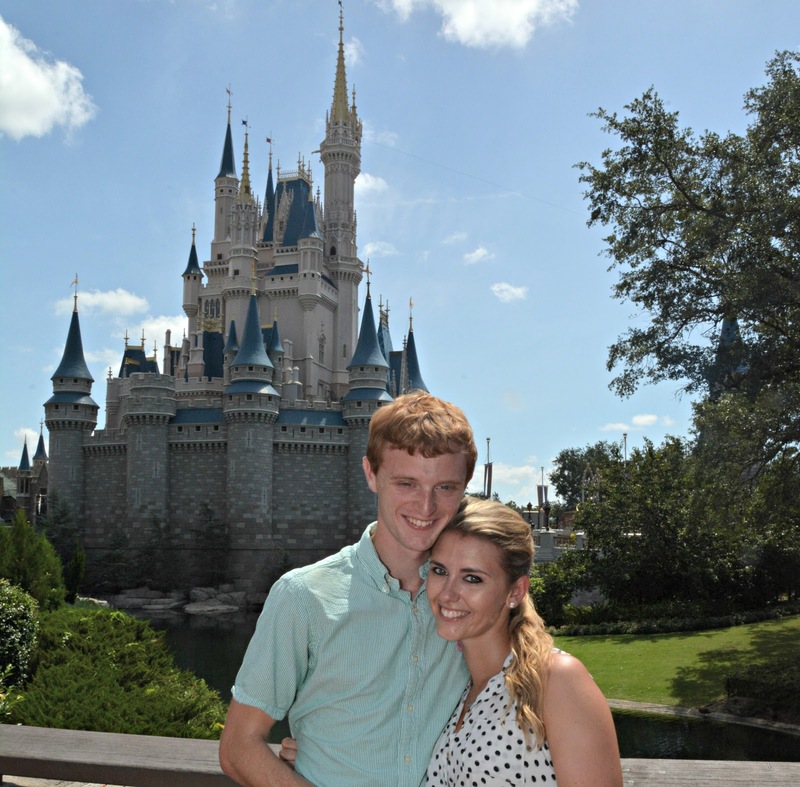 We spent the full day here straight through to Wishes. Throughout the day, in between rides, we ate some Mickey shaped ice cream bars, did a bit of shopping on Main Street and took way too many pictures in front of the castle. Finally, it was nighttime and there is nothing quite like the Wishes firework show to finish out a magical day in Magic Kingdom. This is truly my favorite park and we had simply the best day. Breakfast was at the Crystal Palace with the characters from Winnie the Pooh. It was a lovely buffet and it got us into the Park almost a full hour early! For lunch we went to the Liberty Tree Tavern- a favorite of mine since I am a huge history nerd. I love the colonial decor and comfort food. I had the Colony salad and it was seriously the best salad I have ever eaten: Grilled Chicken, Washington Apples, Sweet Pecans, Applewood-smoked Cheddar, and Dried Cranberries tossed with Field Greens in a Honey-Shallot Vinaigrette. SO good. 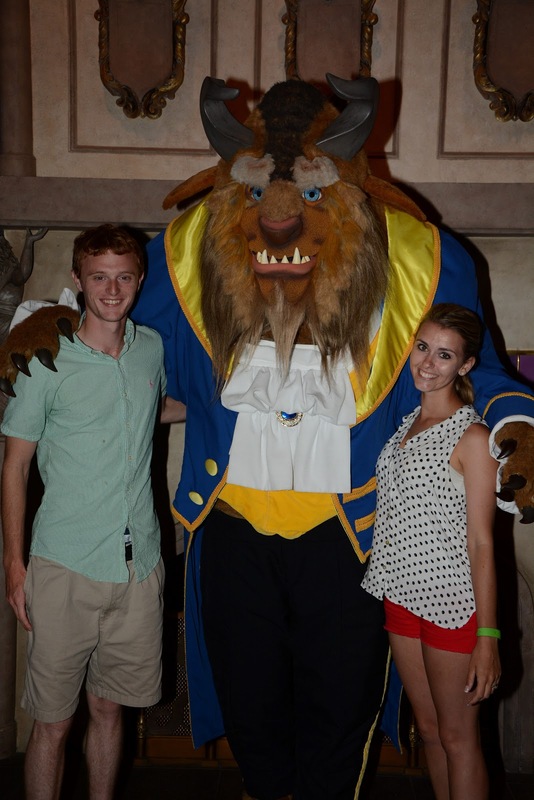 For Dinner we entered the Beasts castle for Be Our Guest! I honestly don't even remember what I ate because all I could focus on was the gorgeous decor and how much it felt like we were in the castle! They even brought the Beast in and you could have your picture taken which we simply had to do. Also, I tried the gray stuff and it was delicious, don't believe me ask the dishes! I went full on Minnie Mouse for Magic Kingdom. I searched high and low for this cute black and white polka dot top(TJ Maxx) and comfy red cut off shorts. I even found a polka dot bow for my hair which was in a summer heat friendly ponytail. I did go for comfy sneakers since I knew it was going to be our longest day which aren't fashionable but were very practical. You can see my hideous but comfy sneakers and our park bookbag in the above photo. We carried a backpack with snacks, drinks and sunscreen with us everywhere (actually my husband carried it if I'm being honest LOL) and I had a small crossbody purse with my phone, hand sanitizer, chapstick and gum. Day 3 of our Disneymoon was in the Animal Kingdom! We started the day bright and early with granola bars and headed straight for Kilimanjaro Safari. This was our first fast pass of the day as I read the animals are most active first thing in the morning. We saw so many animals- Giraffes, Elephants, Okapi, Rhinos and so many more. It was fantastic. 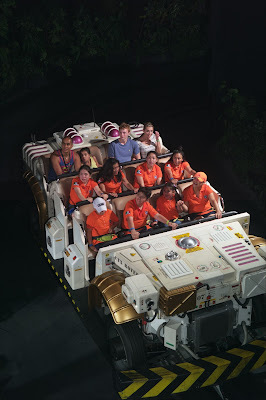 Our next fast pass was Dinosaur the ride- this one is always a blast and makes me scream every time! We hit Expedition Everest next and it was my favorite of the day- what an awesome ride and even the line was fun to see all the Asian artifacts. We walked around Dinoland, did some souvenir shopping and then took a midday break as it was a scorcher and went back to the hotel to lounge by the pool for a bit. When we returned to the park, we were able to use extra fast passes to do Kilimanjaro Safari and Expedition Everest again- double the fun! We also watched the It's Tough to be a Bug show inside of the Tree of Life which is super cute and funny. It was an awesome second half of the day. 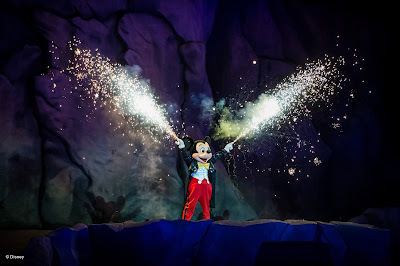 They did a preview of the new Animal Kingdom night show that evening but we did not realize it and scheduled our dinner reservation during that time. 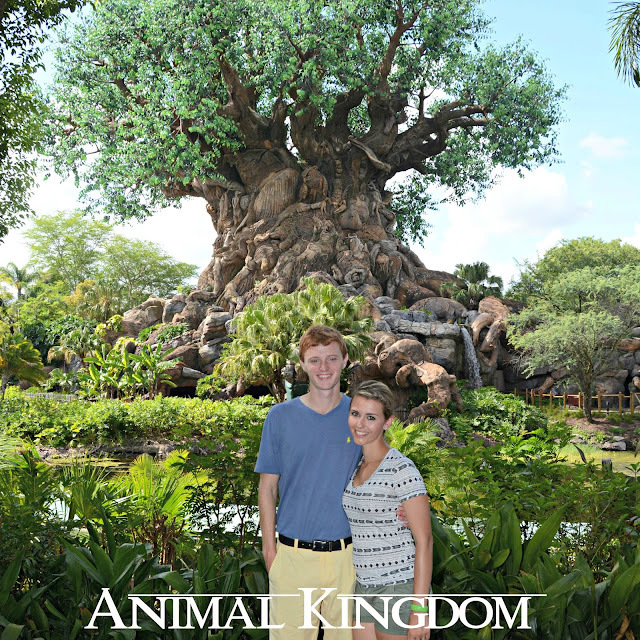 Animal Kingdom was one of our shorter days because it was a super hot day and we were both feeling a little tired. I can't wait to go back and check out the new Avatar park and the night show someday! We had granola bars on the run for breakfast. Neither of us were hungry and we wanted to just get into the park. For lunch, we ate quick service burgers in the Resturantasaurus before heading back to the hotel for a midday break. 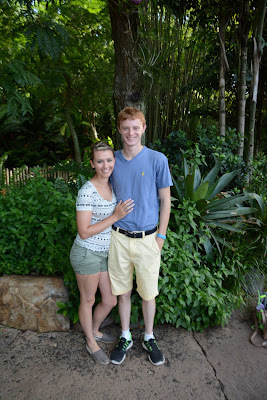 Dinner was at the Rainforest Cafe just outside the park. The atmosphere is so fun and the food is good but we did not have good service for our meal. In the future, I think I will stick to Disney owned restaurants only. I found this cute tribal print top and army green shorts at my local TJ Maxx and it just screamed safari! It was comfy and cool for a hot day in the park. I paired it with comfy Toms shoes and a braided updo that kept my hair off my neck. When we returned to the park for the afternoon/evening, I wore a coral sundress and sandals and left my hair down in the cooler night air. 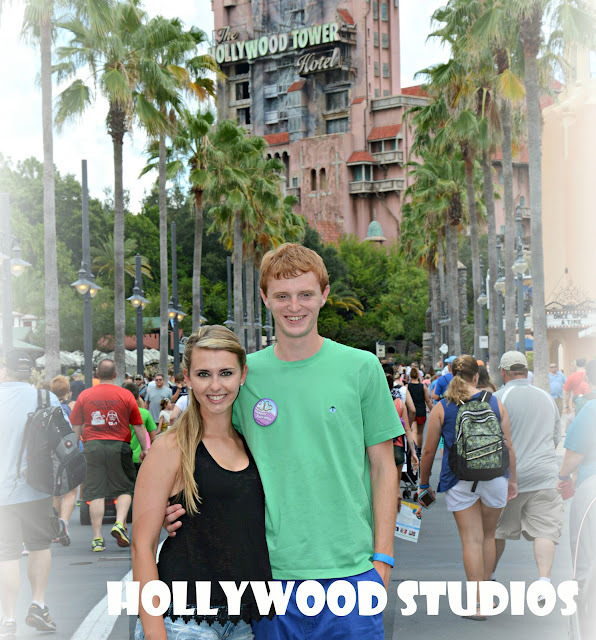 Our final day in Disney was at Hollywood Studios. We got a late start that morning as we were both tired and wanted to sleep in. We had extra magic hours in the evening so we chose to take advantage of those instead of getting into the park first thing. We rushed right over to ride Toy Story Mania because I have heard lines get super long. We enjoyed in and had a short wait. Our first roller c was a personal favorite of mine- Aerosmith's Rockin' Roller Coaster! Quick story, when I was little, this was my first "real" roller coaster. I was scared to death throughout it but as soon as we got off all I wanted to do was ride it again and again. Maybe that's where my love of rock and roll music comes from but either way, it makes for a fun story. 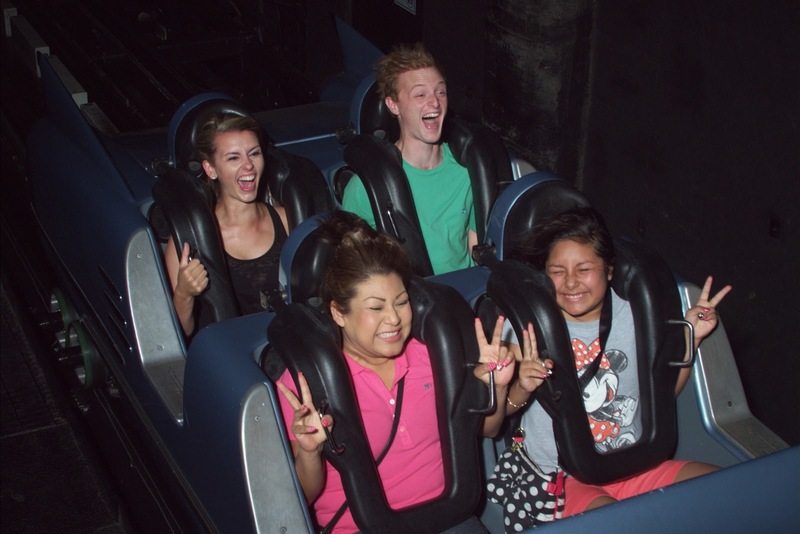 Check out this funny comparison: my first roller coaster compared to my latest. Our other fast passes for the day included Hollywood Tower of Terror, Star Tours, and the Great Movie Ride. We also did the Indiana Jones Epic Stunt Spectacular and Walt Disney: One Mans Dream which is basically a museum of his life. It was really fun to walk around and see all the new Star Wars touches in this park. The stormtroopers randomly walk around and I even got yelled at by the head stormtrooper from the latest movie. Lucky me! We had a dining reservation which gave us reserved seats for Fantasmic. What a fantastic nighttime show! I think it may be my favorite... oh wait I say that about all of them. Either way, we loved it and it was a great last day in Disney. We ordered room service for our morning of sleeping in and our last morning in Disney. For lunch, we ate at the Backlot Express, a quick-service dining area that had yummy burgers. Our dinner package included Fantasmic tickets on top of a wonderful Italian meal at Mama Melrose's Ristorante Italiano. Our food was amazing and getting the reserved seats was awesome because we didn't have to get there early just to get a seat and were able to enjoy the park a little bit more. For the last day, I paired a simple black tank top with cut off jean shorts. I wore comfy Sperry's and my hair pulled back from my face. 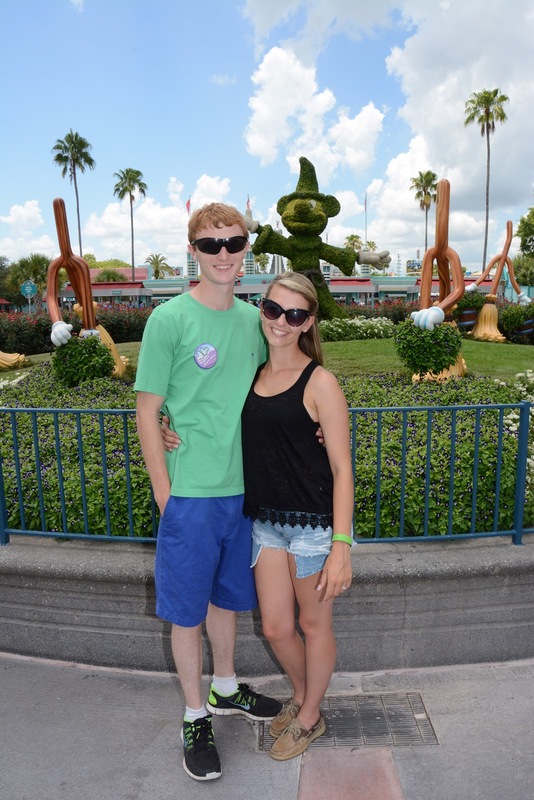 After we finished our time at Disney, we had a day off in which we switched over to Universal Studios. I will be posting a full review of that portion of the honeymoon later. I planned all my outfits ahead of time for each park as outlined above. Additionally, I packed a few extra outfits for days outside of the park, sundresses, and lots of cute but comfy shoes. We also packed lots of snacks (granola bars, trail mix, goldfish) and Britta filtered refillable water bottles. I had a small crossbody purse and my husband carried a small backpack in the park. We also packed lots of sunscreen and sunglasses for the Florida sun! You can hire a travel agent to help plan and book your Disney honeymoon and it won't cost you a dime! Disney actually pays them so you simply reap the benefits. Travel agents are great because they have so much expertise and they can help you get discounts, plan fast passes, remind you to book dining reservations and so much more. It is a great service that won't cost you a thing. We used Keys to the Kingdom and could not have been happier with the service. Additionally to a free travel agent, there are a million blogs on the web that provide super helpful information, tips, and tricks. Some of the most helpful I found were: Disney Food Blog and Disney Tourist Blog. 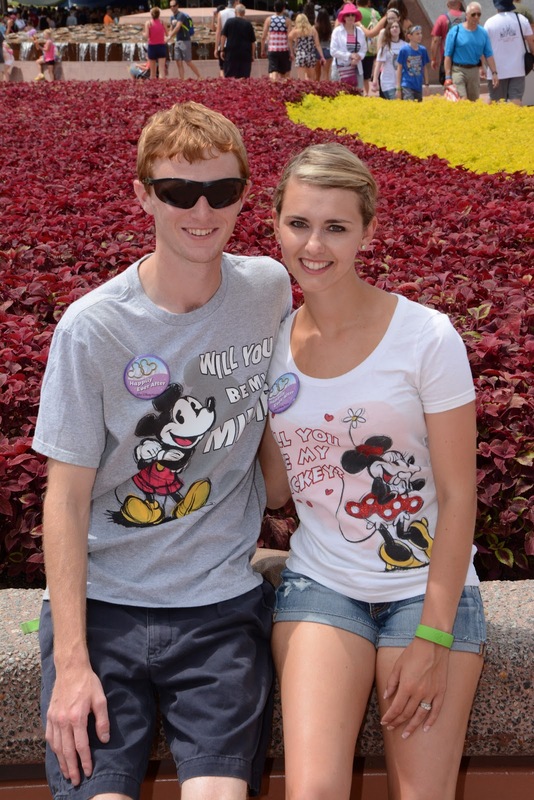 We signed up for a Disney Honeymoon Registry and it was awesome. We were able to sign up for things we wanted to do and people could purchase an "experience" for our honeymoon such as a Safari or a dinner reservation. They ended up sending us the funds for these experiences in one big check so we could book and complete the activities whenever it fit best into the honeymoon schedule. It was so nice to have the funds to complete these fun experiences and much better than getting 6 crock pots as wedding gifts. Finally, a Disneymoon is not for everyone. Some of our friends thought we were crazy but we wanted a honeymoon full of memories and things to do. 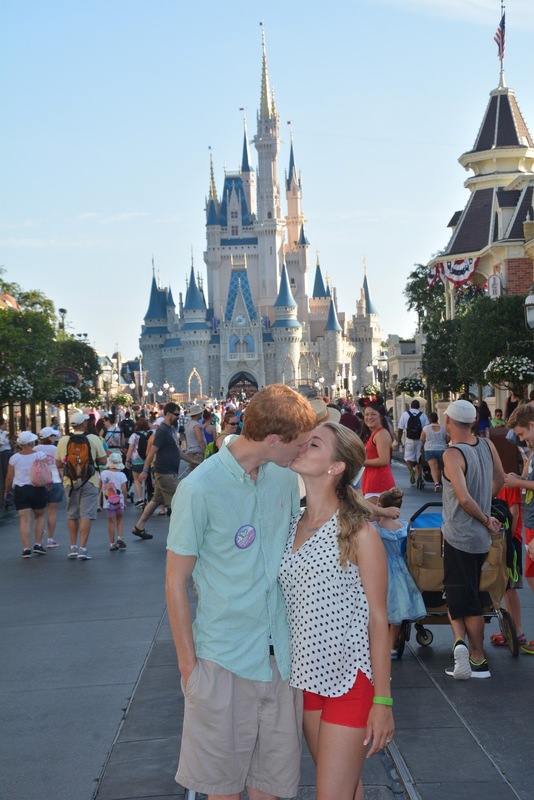 We both love Disney and had not been in years. 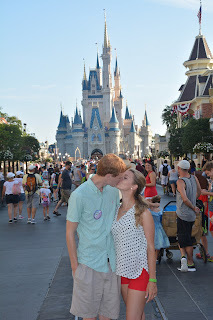 We loved every minute of our Disneymoon and will be able to relive our honeymoon memories many times in the future when we return with our future children. 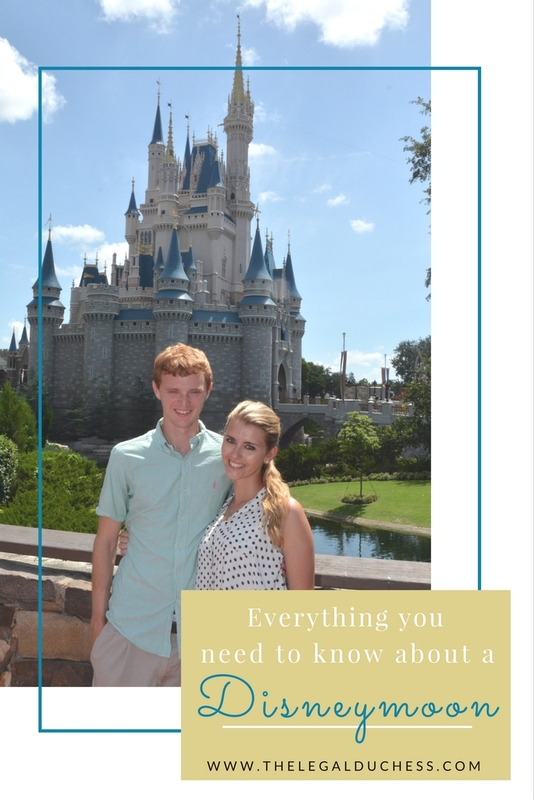 Disney is a wonderful place full of fun and magic as well as excellent service, food, activities and what better way is there to spend your honeymoon? In my opinion, it was absolutely perfect and we simply cannot wait to return.